© Sadanand and Vandana; Licensee Bentham Open. Fluorosis is one of the factors that may bring about mineralization changes in teeth. Routine treatment of root biomodification is commonly followed during Periodontal therapy. The Purpose of the present study was to compare and evaluate the morphological changes in fluorosed and nonfluorosed root dentin subsequent to the application of Tetracycline, EDTA and Citric acid. Both fluorosed and nonfluorosed teeth comprising of periodontally healthy and diseased were included in this study. Each of them was grouped into Tetracycline Hydrochloride, EDTA and Citric acid treatment groupes. Using scanning electron microscope (SEM), the photomicrographs of dentin specimens were obtained. Showed that there was no significant difference in exposure of number of tubules in different groups, while significant increase in the tubular width and tubular surface area was seen in fluorosed healthy, followed by fluorosed diseased groups, nonfluorosed healthy and nonfluorosed diseased groups after root biomodification procedure using various root conditioning agents. The root biomodification procedure brings in definite difference between fluorosed and nonfluorosed dentin specimens. Keywords: Citric acid, dental fluorosis, dentin, diseased, EDTA, healthy, tetracycline. To overcome the limitations of using only mechanical root instrumentation, chemical root surface conditioning has been introduced. Surface demineralizing effect using Tetracycline hydrochloride enhances binding of matrix proteins to dentin and stimulates fibroblast attachment and growth . EDTA exerts its demineralizing effect through chelating divalent cations at neutral pH, while phosphoric acid acts through its low pH and dissolves or erodes a mineralized surface . The American news daily has recently reported the ill effects of high fluoride content on dental tissues . It fails even to mention the freshly reported information on effects of fluoride on periodontal tissues [4, 5]. Although the fluorosis effects on periodontal tissues are at infancy, further studies would throw considerable light on its effects. Dental fluorosis is one of the common complaints of subjects hailing from high water fluoride areas of Davangere district, Karnataka, India. Dental fluorosis is known to cause hypomineralizaton of enamel and dentin . the influence of fluorosis on the cementum is not dealt in literature. Also, the present study arose firstly from our routine clinical observations of moderate to advanced periodontitis in subjects residing from high fluoride belts of Davangere district, wherein, a strong association of periodontal disease with high fluoride water was found using a Community Periodontal index of Treatment needs (CPITN) in a population aged 15- 74 years . Secondly, SEM observations revealed higher globular mineralized debris and partial/initial mineralization of connective tissue fibres (periodontal ligament area) in fluorosed healthy teeth group compared to nonfluorosed group . The routine periodontal treatment in these patients has aroused a doubt, whether the root biomodification effects in fluorosed teeth would remain similar or different as compared to nonfluorosed teeth. Similar situation would occur during acid etching for various restorative procedures and during acid demineralization of dentin in oral histologic preparation. Hence, a first attempt was made in this study using scanning electron microscope for evaluation of number of dentinal tubules, tubular width and surface area in dentin specimens of fluorosed and nonfluorosed teeth which comprised of periodontally healthy and diseased teeth, subsequent to the application of Tetracycline HCl (TTC), EDTA and Citric acid (CA). In this study, fluorosed and nonfluorosed teeth which comprised of periodontally healthy and diseased teeth were included. The freshly extracted teeth were obtained from the Department of Oral and Maxillofacial Surgery, College of Dental Sciences, Davangere, Karnataka, India and were used according to a protocol that satisfied the ethical standards of Rajiv Gandhi University of Health Sciences, Karnataka, India. The extracted teeth were required to meet the following inclusion criteria: were to be fully erupted, extracted non-traumatically due to orthodontic reasons, no history of recent periodontal instrumentation or dental prophylaxis, periodontally diseased teeth with at least 60% attachment loss indicated for extraction and for fluorosed teeth, the fluorotic enamel stains were confirmed by the clinical examination and history of the subjects hailing from natural high water fluoride areas in and around Davangere (Fluoride concentration >1.5 ppm). The exclusion criteria were: teeth with proximal caries extending to the cementum, fillings extending beyond CEJ [cementoenamel junction] and intrinsic stains caused by other reasons such as porphyria, erythroblastosis fetalis, tetracycline therapy etc. A total of 74 fluorosed and nonfluorosed healthy (n=37) and diseased teeth (n=37) specimens were taken for this study. The extracted teeth were immediately washed in sterile saline solution and were stored in bottles containing 0.9% saline. The cementum from each root surface was removed using rotary (fine diamond tapered bur) instruments after sectioning the crown. For the periodontally diseased root surfaces, the root surface was debrided using sharp curettes to remove the diseased cementum. The middle third of the root was considered for obtaining dentin specimens. Each root dentin specimen was divided into three sections to be included in TTC, EDTA and CA groups. In this study, a concentration of 500mg/5ml (100mg/ml), pH 1.8 of Tetracycline HCl 24%, EDTA pH 7.4  and Citric acid pH 1  were used. The specimens were burnished with solution-saturated cotton pellet with respective agents in each group for 3 minutes . Pellets were changed at every 30 second intervals and specimens were then rinsed under running tap water. The specimens were placed in 2.5% Glutaraldehyde in 0.1 M Phosphate buffer (pH 7.4) for a minimum of 24 hours. Following washing and dehydration through a graded alcohol series (25% to 100%), they were mounted on SEM stubs. Mounted specimens were air dried for 48 hours and sputter coated with 30 to 40 nm of gold. Finally specimens were examined using a scanning electron microscope (JEOL-JSM-840A, operating at an accelerating voltage of 20 kV). Representative photomicrographs were obtained at x3500 magnification. SEM photomicrographs were assessed for following findings: (1) no. of dentinal tubules present in individual photomicrograph, (2) measurement of individual dentinal tubule width and (3) measurement of individual dentinal tubule orifice surface area. The entire root surface of each specimen was scanned initially to obtain a general overview of the surface topography of each specimen. Areas characteristic of the general surface topography were selected on each specimen and photographed at a magnification of x 3500 . Area measurements were used to calculate the width of dentinal tubules for each specimen. Area measurements were made by tracing the outline of the dentinal tubules while the photomicrograph was in position on computer screen using Image J analysis software (Fig. 1). The measurements were recorded for each tubule present in the photomicrograph from digital display of the numerical data in µm for tubule width and in µm2 for surface area. Descriptive data was presented as mean ± SD. Difference between the groups was analyzed by Student’s unpaired t-test followed by One Way ANOVA. A p-value of 0.05 or less was considered for statistical significance. A total of 74 fluorosed and nonfluorosed healthy (n=37) and diseased teeth (n=37) specimens were taken for this study. Teeth Specimens were divided into TTC (n=26), EDTA (n=26) and CA=22). All the specimens were evaluated for dentinal morphological changes after the root biomodification procedure using SEM. The results of the study are interpreted in Graphs 1-3, and Figs. (1, 2). Mean number of dentinal tubules exposed. The overall interpretation of mean number of dentinal tubules, tubular diameter and surface area are presented in Table 1 to facilitate discussion of various groups. The overall interpretation of mean number of dentinal tubules, tubular diameter and surface area of dentinal tubules. Using TTC, EDTA and CA, the number of tubules exposed were found to be similar in all groups. On intragroup comparison of individual root conditioning agent in each group, the number of dentinal tubules exposed was similar. All the three root conditioning agents were effective and equivocal in exposing the number of dentinal tubules in fluorosed healthy & diseased and nonfluorosed healthy & diseased. In case of FH group, TTC treated dentin specimens showed the maximum dentinal width (1.73 μm) followed by CA (1.62 μ) and EDTA (1.61 μ). In FD group, EDTA treated specimens showed the maximum dentinal width (1.71 μ) followed by TTC (1.48 μ) and CA (1.38 μ). In case of NFH group, maximum dentinal tubular width was shown by TTC (1.56 μ) followed by EDTA (1.53 μ) and CA (1.33 μ). In NFD group, EDTA treated specimens showed the maximum dentinal width (1.60 μ) followed by TTC (1.55 μ) and CA (1.24 μ). Mean dentinal tubular diameter [µm]. The surface area of dentinal tubule in the present study is directly similar to the result of dentinal tubular width. The demineralization using TTC, EDTA, CA application revealed similar number of dentinal tubules in nonfluorosed healthy specimens and fluorosed healthy dentin specimens; whereas mean tubular width and tubular surface area was found to be highest in fluorosed healthy dentin specimens. The diseased dentin specimens showed the least number of dentinal tubules, tubular width and tubular surface area (Table 1). Mean dentinal tubular surface area [µ2m]. Using TTC, EDTA and CA, the number of tubules exposed were found to be similar in fluoride healthy and nonfluoride healthy groups. On intragroup comparison of individual root conditioning agent in each group, similar number of dentinal tubules were exposed. All the three root conditioning agents were effective/ equivocal in exposing the number of dentinal tubules in fluorosed healthy & diseased and nonfluorosed healthy & diseased dentin specimens. In nonfluorosed healthy dentin specimens, mean no. of exposed dentinal tubules were 10.9 in TTC, 11.5 in EDTA and 11.7 in CA specimens. Other studies have reported mean number of dentinal tubules as 1.79(0.5% TTC) and 1.71(CA, pH 1) in bovine healthy dentin specimens . The concentration of 50-125 mg/ml might alter dentin surfaces by removing the smear layer and also maximize tubule openings in a short period of time, if repeated applications were performed . In nonfluorosed diseased dentin specimens, number of dentinal tubules exposed were 9.4 in TTC, 9.8 in EDTA and 7.7 in CA treated specimens. The related studies reported that 8.4 dentinal tubules got exposed using oxytetracycline (pH 1.3) and 17.1 in CA (pH 1) groups  while 34.3 dentinal tubules got exposed in 24% EDTA group . In both the above mentioned studies, the magnifications of photomicrograph were different from this study. In our study, there was no significant difference found between number of exposed tubules in TTC and CA treated specimens; similar to result obtained by Vandana D et al. . Measurement of dentinal tubular orifice width serves as an index for the intensity of etching. In FH group, TTC showed maximum tubular width as compared to EDTA and CA. The mean tubular width was similar in EDTA and CA groups. In FD group, EDTA showed maximum tubular width (1.71 µ) as compared to TTC and CA. The mean tubular width was not significant when compared between TTC vs. CA. In NFH group, TTC showed the maximum tubular width (1.56 µ) as compared to EDTA and CA. The difference in mean tubular width was significant between TTC vs. CA. While in other studies, tubular width of 1.48 microns (0.5% TTC, pH 3.2) and 1.91 microns (CA, pH1) was observed in bovine dentin specimens . Isik G et al. reported the dentinal tubular width to be 3.40 microns (TTC, pH 1.36) in healthy dentin specimens, whereas 2.21 microns (0.5% TTC, pH 2.1) dentinal tubular width is reported . Labahn R et al. reported the dentinal tubular width to be 1.66 microns (TTC), 2.21 microns (CA) in healthy dentin treated specimens . In the current study there was no significant difference between TTC and CA treated specimens. In NFD group, CA showed the minimum tubular width (1.24 µm) as compared to TTC and EDTA. The mean tubular width was highly significant between CA vs. TTC and CA vs. EDTA. In other study, dentinal tubular diameter of 2-3 microns using 15% EDTA was reported  whereas 0.99 microns (oxytetracycline) and 1.30 microns (CA, pH1) has been reported by Vandana et al. . In our study highly significant difference was obtained in TTC vs. CA treated specimens, while no significant difference was obtained in the comparitive study by Vandana et al. . The recent study related to the use of various root modification agents that are citric acid, tetracycline, and doxycycline on periodontally involved root surfaces showed that tetracycline was found to be the best root conditioning agent in removing the smear layer, uncovering and widening the dentin tubules and unmasking the dentin collagen matrix . In another study where the efficacy of Citric Acid, Ethylenediaminetetraacetic Acid (EDTA), and Tetracycline Hydrochloride as root biomodification agents on periodontally compromised teeth was compared, it was found that all three agents appeared to be equally effective as root biomodification agents. However, in clinical practice EDTA might be more beneficial owing to its neutral pH and high efficacy in removing the smear layer and opening the dentinal tubules . It has been suggested that an increase in tubule diameter may enhance regeneration by inducing the formation of cementum pins . This may increase the surface area and the amount of exposed collagen available for new attachment . In this study, the overall expression of increased tubular width in fluorosed group (both healthy and diseased) is corroborated with the findings of Vieira et al. who reported a positive correlation between fluorosed dentin and dentin tubule size, demonstrating wider dentinal tubules in teeth with higher levels of fluoride in dentin. This is interesting because fluoride concentration has been shown to influence crystal size, and same evidence indicates that fluoride has an effect on cell function, either directly through interactions with the developing ameloblass and/or odontoblasts or more indirectly by interacting with extracellular matrix. Another hypothesis is that fluoride would influence crystal growth, forming an impaired dental structure with wider dentin tubules . In the present study, the surface area of dentinal tubule was similar to the result of dentinal tubular width. In non-fluorosed healthy dentin specimens, the mean dentinal tubule surface area were 3.58±1.81 in TTC, 3.46±1.24 in EDTA, and 2.74±2.21 in CA treated specimens. Hanes et al. reported 5.25% of total surface area of dentinal tubules using 0.5% TTC (pH 3.2) and 6.80% using CA (pH 1) in bovine dentin specimens . Above study reported surface area in the form of percentage of area occupied by tubule orifices instead of surface area of each tubule, that is directly proportional to the tubule diameter which determines the ingress of connective tissue into the dentinal tubules. PubMed search does not reveal any comparative studies between fluorosed & nonfluorosed dentin surface changes following chemical root conditioning. Recently published article by Vandana K L addresses the effect of fluorosis on periodontium . The differences between the present results and those of other studies may be related to the specimens utilized, the extent of instrumentation, the concentration of the conditioning agents, or a combination of these variables. Also, the biochemical and morphologic changes in the root surface produced by the various mechanical techniques and conditioning agents are yet to be understood. The need of the hour is to have uniform methodology for root biomodification studies that can be used as comparable data. Root biomodification and desensitising agent procedure brings in definite difference between fluorosed and non-fluorosed dentin specimens. Using Tetracycline, EDTA and Citric acid, the number of dentinal tubules exposed was found to be similar in all groups that is in fluorosed healthy and diseased; nonfluorosed healthy and diseased. All the three root conditioning agents were effective and equivocal in exposing the number of dentinal tubules in fluorosed healthy and diseased; nonfluorosed healthy and diseased. The number of dentinal tubules ranged from flourosed healthy, 8.7 to 10.3; nonfluorosed healthy, 10.7 to 11.7; fluorosed diseased, 7 to 11; nonfluorosed diseased, 7.7 to 9.4. Using tetracycline, EDTA, citric acid, there was no significant difference in exposure of number of dentinal tubules, while highly significant increase in the tubular width and tubular surface area was seen in fluorosed healthy followed by fluorosed diseased, nonfluorosed healthy and nonfluorosed diseased groups after root biomodification. The dentinal tubular width ranged from : fluorosed healthy, 1.61 to 1.73µm; nonfluorosed healthy, 1.33 to 1.56µm; fluorosed diseased, 1.38 to 1.71 µm ; nonfluorosed diseased, 1.24 to 1.55µm. These results highlight the efficacy of these agents in conditioning fluorosed and nonfluorosed teeth and also relatively greater conditioning of fluorosed teeth compared to nonfluorosed teeth. The authors would like to thank Dr. Srinivas Wanaki, Professor and Head, Department of Oral Pathology, Dr. Ravi Pujar, Postgraduate Student, PMNM Dental College, Bagalkot for their help to use the software and for helping in the calibration study. Terranova VP, Franzetti LC, Hic S, et al. A biochemical approach to periodontal regeneration: tetracycline treatment of dentin promotes fibroblast adhesion and growth. J Periodontal Res 1986; 21(4): 330-7. Blomlöf J, Lindskog S. Periodontal tissue-vitality after different etching modalities. J Clin Periodontol 1995; 22(6): 464-8. Fluoride in water now reaches 70% of Americans 2008. Available at: www.Dentalindia.com/diup160708.html [Accessed on July 16, 2008]. Vandana KL, Reddy MS. Assessment of periodontal status in dental fluorosis subjects using community periodontal index of treatment needs. Indian J Dent Res 2007; 18(2): 67-71. Vandana KL, George P, Cobb CM. Periodontal changes in fluorosed and nonfluorosed teeth by scanning electron microscopy. Fluoride 2007; 40(2): 128-33. Vieira AP, Hancock R, Dumitriu M, Limeback H, Grynpas MD. Fluoride’s effect on human dentin ultrasound velocity (elastic modulus) and tubule size. Eur J Oral Sci 2006; 114(1): 83-8. Blomlof J, Blomlof LB, Lindskog SF. Smear layer formed by different root planing modalities and its removal by EDTA gel preparation. Int J Periodontics Restorative Dent 1997; 17: 243-9. Garrett JS, Crigger M, Egelberg J. Effects of citric acid on diseased root surfaces. J Periodontal Res 1978; 13(2): 155-63. Isik AG, Tarim B, Hafez AA, Yalçin FS, Onan U, Cox CF. 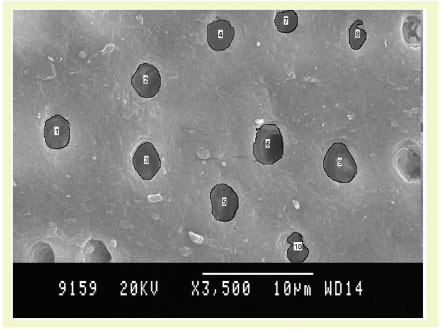 A comparative scanning electron microscopic study on the characteristics of demineralized dentin root surface using different tetracycline HCl concentrations and application times. J Periodontol 2000; 71(2): 219-25. 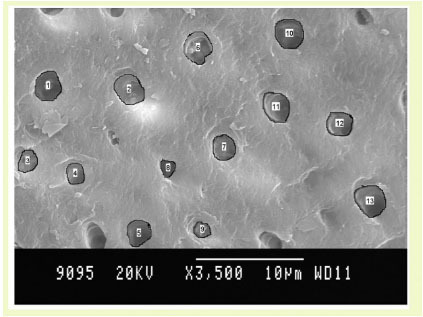 Vandana L, Sadanand K, Cobb Charles M, Desai R. Effects of tetracycline, EDTA and citric acid application on fluorosed dentin and cementum surfaces: an in vitro study. Open Corros J 2009; 2: 88-95. Hanes PJ, O’Brien NJ, Garnick JJ. A morphological comparison of radicular dentin following root planing and treatment with citric acid or tetracycline HCl. J Clin Periodontol 1991; 18(9): 660-8. Desai V, Cherian G, George JP. Comparative evaluation of surface alterations on diseased roots subsequent to application of citric acid and oxytetracycline hydrochloride. J Indian Soc Periodontol 1999; 2(3): 13. Işik G, Ince S, Sağlam F, Onan U. Comparative SEM study on the effect of different demineralization methods with tetracycline HCl on healthy root surfaces. J Clin Periodontol 1997; 24(9 Pt 1): 589-94. Labahn R, Fahrenbach WH, Clark SM, Lie T, Adams DF. Root dentin morphology after different modes of citric acid and tetracycline hydrochloride conditioning. J Periodontol 1992; 63(4): 303-9. Lasho DJ, O’Leary TJ, Kafrawy AH. A scanning electron microscope study of the effects of various agents on instrumented periodontally involved root surfaces. J Periodontol 1983; 54(4): 210-20. Chahal GS, Chhina K, Chhabra V, Bhatnagar R, Chahal A. Effect of citric acid, tetracycline, and doxycycline on instrumented periodontally involved root surfaces: A SEM study. J Indian Soc Periodontol 2014; 18(1): 32-7. Harpreet SG, Anil Y, Prashant N. A comparative evaluation of the efficacy of Citric Acid, Ethylene Diamine Tetra Acetic Acid (EDTA) and Tetracycline Hydrochloride as root biomodification agents: An in vitro SEM study. Int J Contemp Dent 2011; 2: 1-7. Register AA, Burdick FA. Accelerated reattachment with cementogenesis to dentin demineralization in situ II.Optimal range. J Periodontol 1976; 47: 497-505. Ririe CM, Crigger M, Selvig KA. Healing of periodontal connective tissues following surgical wounding and application of citric acid in dogs. J Periodontal Res 1980; 15(3): 314-27. Vandana KL. Fluorosis and periodontium: A report of our institutional studies. J Int Clinc Dent Res Organ 2014; 6: 7-15.